Whenever I have been in South Australia lately, my feet seem to drift, inevitably, south to the Fleurieu Peninsula. 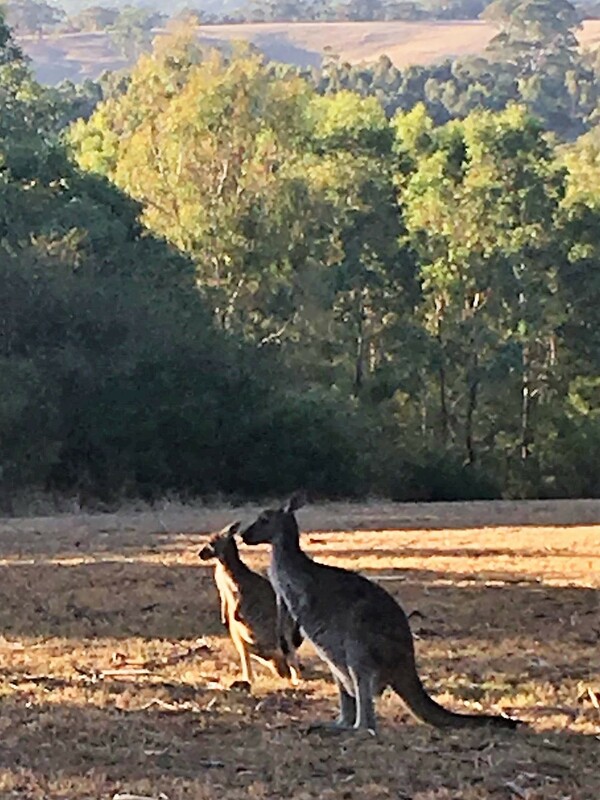 A recent trip found me pottering through the Adelaide Hills to Clarendon and McLaren Flat at twilight, with Son Number Two, where we found paddocks teeming with grazing kangaroos, a pair of doe-eyed, silky-soft baby alpacas and a caravan of camels. Well, a herd really, but caravan sounds so much more romantic. 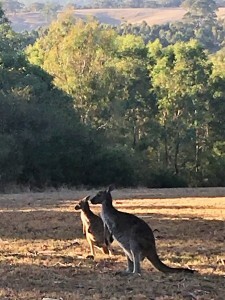 There were flocks of rosellas and galahs and the usual array of sheep, cows and horses. All of which made us squeal like over-excited five-year-old’s at a birthday party. Another day, and I wandered west from Port Willunga with my parents. It was an exceptionally warm, dreamy, autumn afternoon. Lurking at the end of a country lane lined with grapevines, we came across the Currant Shed, a restaurant that spills out into an orchard on one side and overlooks a vineyard on the other. As its name suggests, it was once a shed for drying currants, which were then exported to Europe. Today it harbours far more elaborate fare: a small but exotic menu, offering modern Australian cuisine with a splash of Japan. Our waitress was chatty and charming, as friendly and attentive as if we had popped into her own kitchen for a bite to eat. There was a soothing intimacy about the dining area, that drew hushed but happy conversations from the diners, unlike the echoing babble that is too often the case in busier, city restaurants. We sipped our Adelaide Hills rosé and perused the menu, nibbling on fresh sour dough rolls served with whipped butter. The butter had been sprinkled with chunky pink Grenache salt, ever so slightly smoky in flavour. Glorious. With much deliberation, we managed to order three of the four entrées between us. 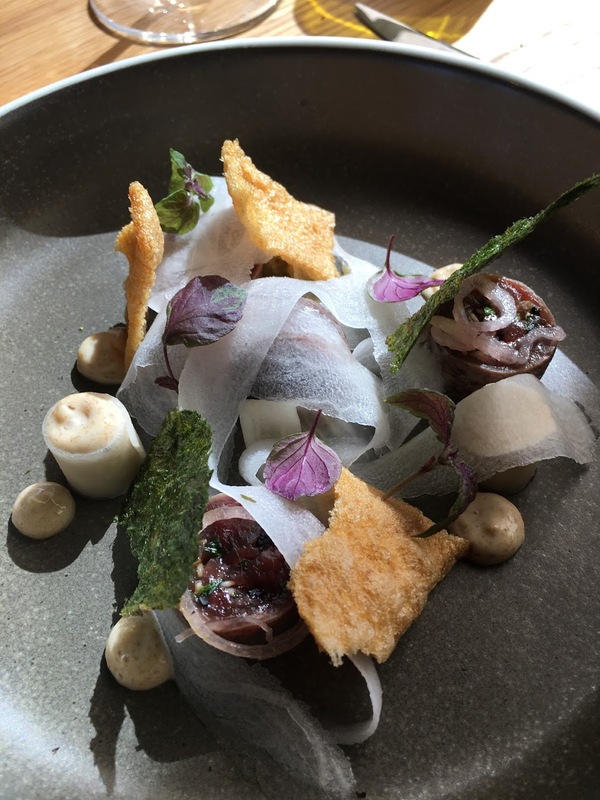 There was salmon served with plum and horseradish and accessorized with charcoal coloured crisps – think prawn crackers – made from salmon skin. The beef tartare was an artistic composition I know not how to describe – so for once I must rely on a photograph to do the talking for me. And finally, tuna sashimi served on a nest of Asian coleslaw and finger limes for a dash of indigenous Australia, garnished prettily with nasturtium petals and pink and white daikon curls. It was superb: a flavourful mélange of taste, texture and colour. My mother was delighted with a bowl of plump pumpkin tortellini topped with crumbled feta, sage and crunchy pepitas, while Dad and I, completely carnivorous, devoured juicy kangaroo fillets served on sauerkraut, with kale crisps and smoked mash. Talk was limited to the satisfied noises one makes with a mouthful of food, glorious food. And then, blissfully replete, we sat back peacefully over coffee and a wonderful view of blue skies, verdant green orchard and the dusty haze of the khaki green bush beyond, enjoying the lazy Sunday afternoon ambience in the middle of the week. It is, to date, one of my favourite South Australian dining experiences. Finally, as part of Tasting Australia, Number One Son & I boarded a bus from the City and travelled out on the southern expressway to McLaren Vale. We were off to Alpha Box & Dice, with aspirations to taste all twenty-one of their proffered wines. It was a balmy evening of clear, star-speckled skies. Fairy lights were draped over the vines. Numerous braziers glowed and smoked on the lawn. Staff served a cheerful welcome with trays of tasty hors d’oeuvres and glasses of prosecco to help set the mood. The setting was beautiful. AB&D is a young boutique winery born in 2008. It claims to ‘make wines without boundaries; a laboratory for viticultural exploration.’ Here, innovative, enthusiastic young winemakers randomly blend an assortment of grape varieties – ‘vinous bricolage’ they call it, most poetically – with a strong lean towards lesser known Italian varietals such as Nebbiolo, Montepuliciano, Ripasso and Aglianco. The resulting wine list abounds in creative blends and amusing names. Kit and Caboodle, for example, is an unlikely white blend of Chenin Blanc, Gewurtztraminer, Gruner Veltliner and Riesling. The staff presented the wines with light-hearted humour, but obvious pride in their creations. We chatted with them freely and came away with plenty of fascinating information and quirky descriptions. Here are some of my favourites. Siren is described as ‘rich berry and plum fruits are underscored with enough abundant exotic spice, burnt orange and lavender complexity to lure the canniest of wine drinkers to their fate.’ Made from grapes grown in McLaren Vale, Nero d’Avola originated in Sicily. And so it seems obvious to transplant it to another place of sunshine, sea and vines. The Apostle is made with a blend of Durif and Shiraz grapes. ‘It’s inky, compact and earthy, with a solid core of slatey fruit that strike through the wine like an obelisk of vinous truth.’ Yet another thoroughly quirky description to accompany a wine with amazing flavour and texture. So, we sat beside the fire and beneath the stars, sipping peacefully at sirens of the sea and making new friends among a gathering of like-minded wine lovers eager for adventure…. This entry was posted in Australia, Food & Wine and tagged Alpha Box & Dice, McLaren Vale, South Australia, Tasting Australia, The Currant Shed. Bookmark the permalink.